Shareaholic social share-counts already provide your site visitors with impactful insight into the popularity of your content across social platforms with striking, visual metrics. And each share-count is hard earned evidence of your content’s value and reach. But along with our newly available share-count services, which now include counts for Yummly and Fancy.com, and the option to conditionally display share-counts, we got to thinking: Why not provide a way to showcase the sum of all your hard work? And the solution was clear: Total Share-Counts! Now all Share Buttons powered by Shareaholic automatically give you the option to showcase the total number of shares, worth way more than the sum of it’s parts! In addition to choosing where you want the total share counter to appear, you can also personalize what you want to call your shares (ex. 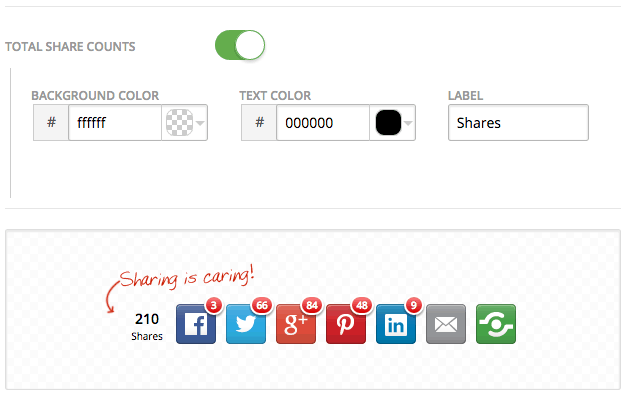 “Shares”, “Likes”, “Favorites”), and customize the background and font color to match your site’s design perfectly. In summation, put a concrete visual to the overall value of your content, and leave the math to us! For more information on how to activate and customize your total share counts, be sure to peruse our Total Share Count support document here. And please, don’t hesitate to reach out to our support team, via Twitter @shareaholic or email, by writing into support@shareaholic.com.